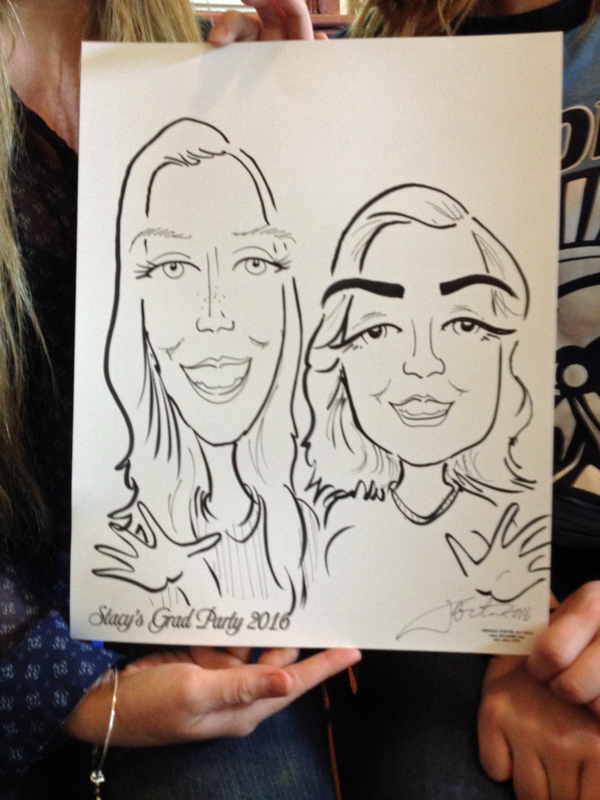 Mr. Porter’s caricatures are one-of-a-kind party favors your guests take home after the party ends; they make great gifts (from you) that will be enjoyed for years. IMPRINTED PAPER: If you have a special idea for a birthday wish or a theme for your event, ask us about customized sketch paper. These drawings are a permanent reminder of the event; they’re light-hearted in nature, and Dennis is a great conversationalist sure to entertain anyone who sits down for a drawing.The art does not go away when the act is over, and your guests will look back at their caricatures and remember just how fun your party was. 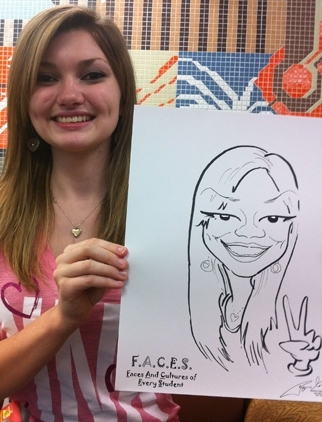 WHY CHOOSE CARICATURES BY DENNIS PORTER? Half price, and half as fast, is no bargain if your guests waste their evening waiting endlessly in line. Dennis is responsive and quick, allowing him to draw big crowds at multi-hour events. Ask Dennis what it means to get a resemblance and he’ll tell you it’s more than just sketching their hairdo or adding someone’s checkered shirt. Real resemblance is all in the details, capturing their personality and adding specific references to that person’s interests when possible. That comes only with experience. We are professional in every way! No hats, cutoff jeans, T-shirts or bad attitude here. Dennis will be on time, dressed well, courteous to your guests, and ready to entertain for as long as your party lasts! Mr. Porter will never encourage tips from your guests; that is unprofessional and amateurish. And please, no food or alcohol for the artist — a professional does not drink and draw. Let our manager Diane call one of our guest artists — or other entertainers ranging from face painters to clowns — to work with Dennis! Please tell her what you need and we will find that kind of entertainment for you. 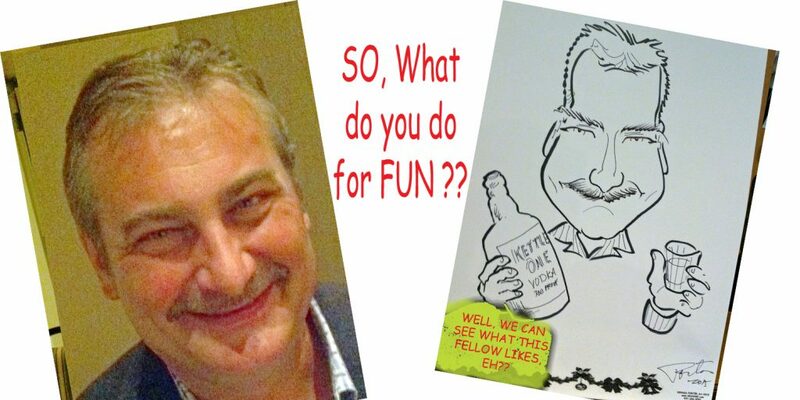 Dennis Porter will be the life of your party, on the job, drawing full speed for the entire time you authorize. Expect tremendous party entertainment your guests are going to LOVE. Questions? Comments? Ready to plan your party? Schedule your event know to secure your date and hours! A group picture is no problem for Dennis — this crew was attending a party in Dayton, OH. Resemblance with a personalized touch. Dennis has a true talent for getting likeness and detail in his drawings. Schedule your event NOW to Secure your Date and Hours! The faster the better! 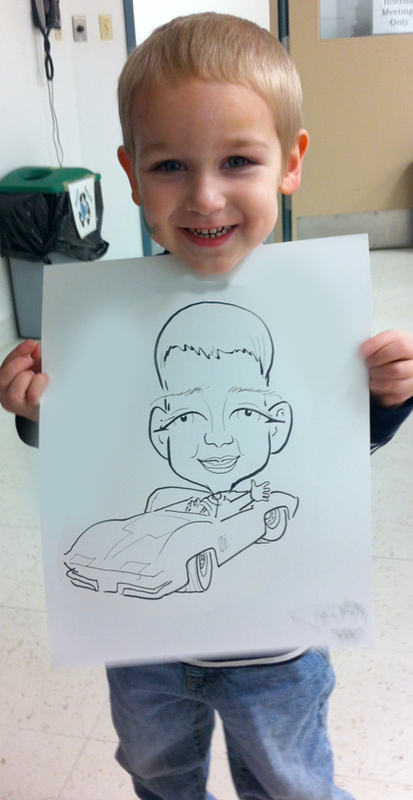 This young car enthusiast’s drawing was done in three to four minutes. 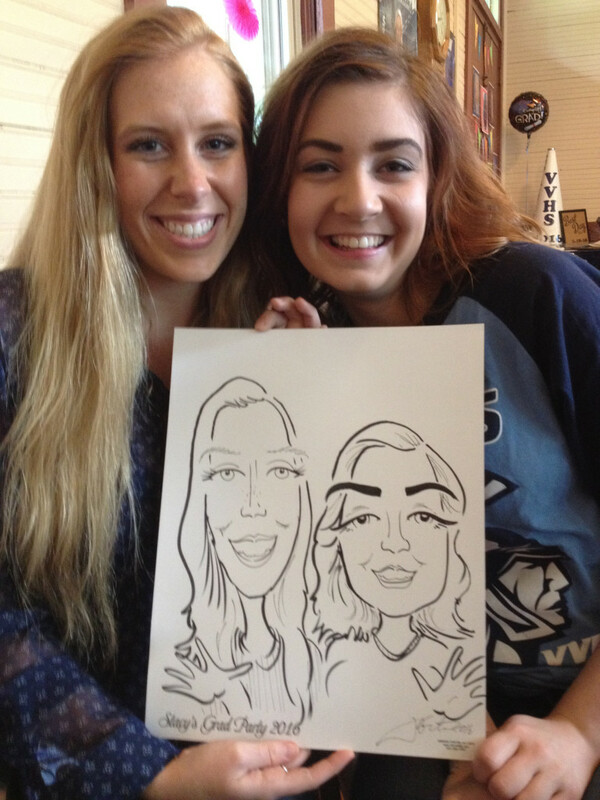 No matter the interests Dennis is able to smoothly incorporate them into a personalized sketch. 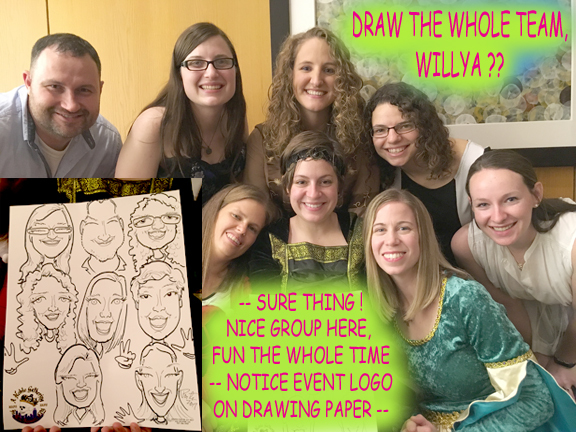 Quick-sketch group drawings like these are fun for everyone involved -- as fast as 2 Minutes a person for a life-long gift for guests to take home.